Salesforce Enterprise and Unlimited editions automatically have API access. API access can be added to the Group and Professional editions (there may be an additional fee). Force.com plans do not include API access. To find out which plan you have, check out this article: Does my Salesforce plan include API access? If your Salesforce plan doesn't include API access, you can't connect to Salesforce using the API, but you can still auto-bcc each email to Salesforce. Read more on how to auto-bcc emails to Salesforce. Go to the Integrations page in your Settings, and check to see that you're connected to Salesforce. 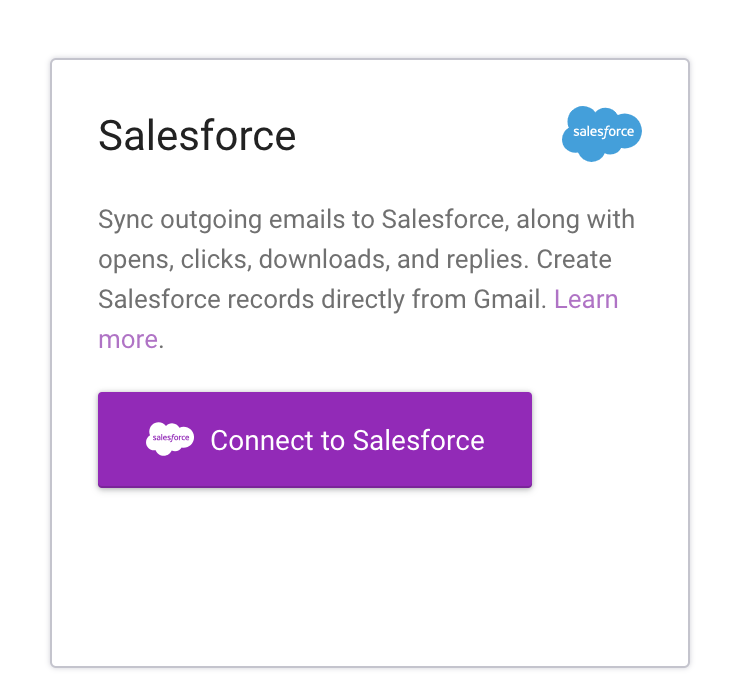 Click Connect to Salesforce and enter your Salesforce credentials: email and password. If you are unable to connect, please refresh your browser tab and try again. Once you're connected to Salesforce, check to see which events you are logging to Salesforce. You can log sent emails, opens, clicks, downloads, replies, and meeting confirmations. 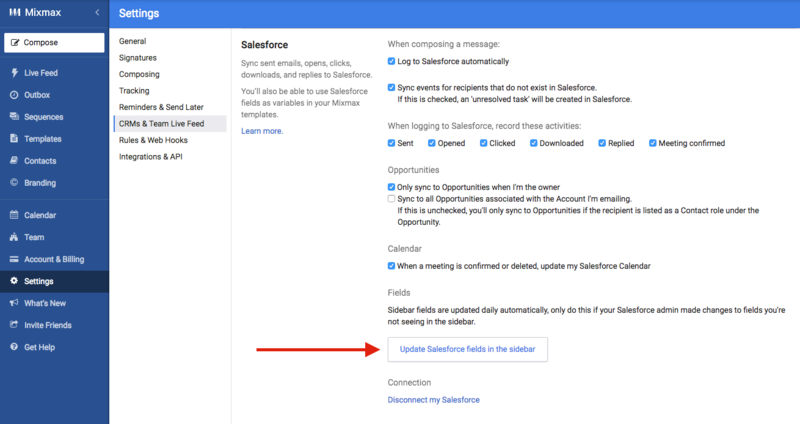 If events are not being logged if a recipient does not exist as a record in Salesforce, you may need to check the box next to Sync events for recipients that do not exist in Salesforce. If events are not being logged to Opportunities, you may need to un-check the box next to Only sync to Opportunities when I'm the owner. If you're testing your logging with friends or coworkers, check to see whether their email domain or email address are excluded from logging. Sidebar fields are automatically updated daily. If your Salesforce admin made changes to fields and you don't see those changes in the sidebar, click Update Salesforce fields in the sidebar to see those changes immediately. Each Salesforce plan has a limit to the number of API calls that are allowed 1) concurrently within a 20-second period, and 2) within a 24-hour period. The limit is determined by your plan, and whether your organization has purchased additional API calls. Learn more about API limits for standard plans in this article from Salesforce: API Requests Limits. You can check the API limit for your plan by going to Your Name > Setup > System Overview. Check under API Usage to see the number of API calls you've used. If you're on a new version of Salesforce, navigate to this area by going to Setup > Monitor > System Overview > API Usage. Note that you may need special admin permissions to see this information. You can also follow the instructions in this article: Does my Salesforce plan include API access? If you have exceeded your API limit, consider 1) purchasing additional API calls, or 2) refraining from logging opens, clicks, or downloads, as this activity is also available in your Live Feed. You may need to enable the Mixmax app within Salesforce. Here's how: Enable Salesforce to use the Mixmax app. Our Customer Success team is happy to help! Send us a note at success@mixmax.com!